When it comes to January and the new year I always reflect on the previous year and with sharing my 2018 beauty favourites (which you can read here) with you recently, I wanted to reflect on last years beauty favourites and see if I am still enjoying/using any of those products on a regular basis. 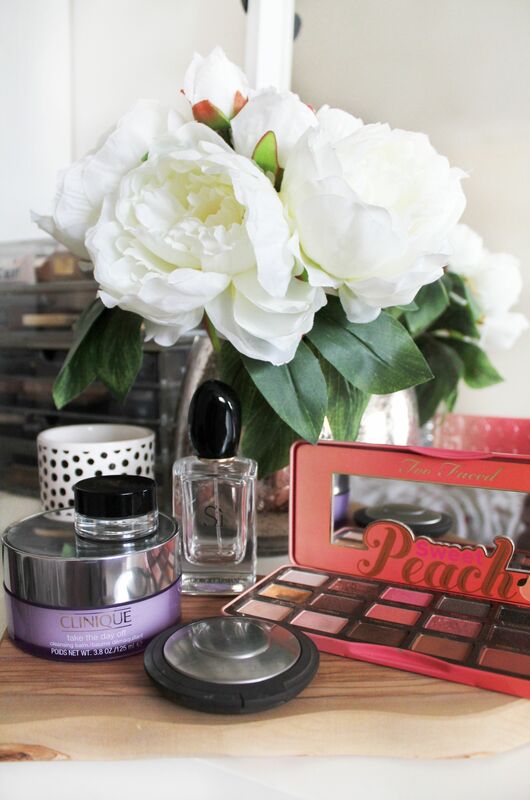 Take a walk down memory lane with me and see which beauty products i’m still loving a year on. Looking back at last years 2017 beauty round up post i’d been loving quite a few products that i’d used on and off throughout the year and although i’m still loving some of those products there wasn’t enough to put together a blog post, so I also looked back to my January favourites from last year and with those two posts there were a good few products that i’m still very much enjoying. This year i’m somewhat vowing to revisit old favourites and only repurchase products I truly need and know i’ll get the use out of them. Call it my way of being a little more aware of the planet in 2019 of which i’m kind of doing offline because i’m not opening myself up to criticism, at least not just yet. Kicking it off with the holy grail product that i’ll never get bored of is the Too Faced Sweet Peach Palette (£39) which i’ve featured in many blog posts over 2018 and no doubt it’ll get a lot more love this year. It’s one of those all round perfect palettes that has a good variety of shades that allows you to create some pretty damn good eye looks! As you can see i’ve hit pan well and truly on one of the shades and i’m going to be so sad when that shade fully runs out (insert crying emoji). Another product that is somewhat on it’s last legs is my Becca Shimmering Skin Perfector (£30) which I use as my daily highlighter and have done since I purchased this back in 2017. It’s just the most stunning highlighter i’ve ever owned and trust me because this gal owns a lot of highlighters! Another holy grail beauty product that i’ll never be without is the ABH Dip Brow (£19) because without this beauty my brows would be an absolute mess. Ever since getting shade matched when I went to Australia i’ve not looked back nor have I really strayed from this product other than when i’ve ran out or have just wanted a more natural brow look. If you’ve still not tried this product then i’d really urge you to because I know so many people who love this brow product. Moving onto more skin products, if a fragrance can come under that category.. but anyway a fragrance that I featured a lot in 2017 was the Giorgio Armani Si (£43.95) and is still a fragrance I adored through 2018 so much so that I featured the Passione version in my 2018 round up. Having said that the classic original version of this fragrance is still a firm favourite and i’ve got a brand new bottle ready and waiting for when this one finally bites the dust. Finally the last product is a cleanser i’ve used on and off, have recently repurchased because I forgot how much I loved it this time last year, and that is the Clinique Take The Day Off Cleansing Balm (£24). When it comes to oil cleansers my skin can be a bit picky, one minute it loves an oil cleanser and the next it hates it but this one seems to just get my skin and removes makeup like no other! So those are the products i’m still loving a year on from my 2017 beauty favourites!